"My name is Kendra and I am a long time travel expert who has been packing my bags and traveling the world since I was 3 months old! My passion for travel is only eclipsed by my passion for my three beautiful children. I’ve been lucky to combine the two, and am often featured as an expert in family, luxury and adventure travel for FOX News, ABC, CBS, NBC, and CW networks. Personally, I've been to 28 countries on 6 continents, and have been quoted in the news about seasonal travel trends and destinations all over the United States. Now stepping out of the corporate spotlight to take on my role of being the number one mom and wife to a family of three, I've found my utmost desire in life is right here in my own home. I have mixed my excitement for travel by bringing the taste of authentic cuisine to my own home with some of my unique recipes". Now here follows the wonderful recipe along with her experience and memories of travel. I hope you enjoy it. One of my most favorite things about traveling is to try new foods. Hawaii was a surprise to me because, although it is in the same country, its flavors are a world away. This time I stayed at the Halekulani Hotel, amongst some of the top hotels in Honolulu, and what a jewel this place was! Situated on the famous Waikiki Beach down Kalia Road in Honolulu, this place has been serving people in style for more than 100 years. After a heavenly day of sunning on the beach and playing in the blue ocean, I tucked into the hotel restaurant for a bite to eat. I ordered a salad off the menu thinking a light lunch would be best for the beachwear. I ordered a simple Asian Chicken Almond Salad, but was gob smacked by the rich flavor. Before I left the island, I had ordered this salad a dozen more times. I knew that I would have to figure out this recipe to bring it back to the East Coast and share with my friends and family. So I set to searching online and found this recipe inspired by the same salad from Halekulani Hotel. 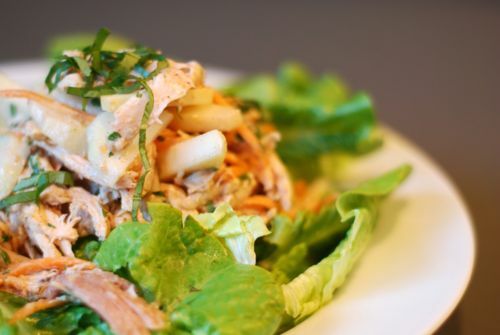 Try this Nom Nom Paleo recipe and find a whole host of substitutions to make this salad your very own signature dish. First prepare the dressing by combining all the ingredients from the dressing ingredient list, and whisk to emulsify. Next, build the salad by slicing the kohlrabi and with julienne peeler shred the carrots. Toss these vegetables and slivered almonds into a bowl. Add the dressing, the chicken and the herbs and toss all together. Serve on a bed of romaine lettuce. I hope you enjoy this meal just as much as my family and I do!